With the just-announced Xperia Z, Sony pulled the trigger on a Full HD smartphone, which HTC did with the Droid DNA, and Samsung hasn't done yet, yet its Galaxy S III keeps delivering sales backed in so small part by the company's larger-than-life reputation in smartphones now. That's why we are running the three against each other in the specs list table below for easier comparison. As you can spot from a distance, the Xperia Z has every chance to become the hit Android device after it launches this quarter, at least until phones like the eventual Galaxy S IV or Optimus G2 start flaunting their stuff. The Z is almost as compact as the Galaxy S III, and smaller than the Droid DNA, despite its waterproof certification, microSD card slot availability and glass chassis construction. It weighs only slightly more than the two, yet is built out of premium materials as it fits for a high-end smartphone, instead of the polycarbonate plastic used for HTC's and Samsung's handsets. Sony's new flagship also has the largest battery capacity of those three, but 3rd party endurance tests will show its true performance. The same thing goes for the 13 MP Exmor RS camera on the back of the Xperia Z, which will be judged by its first sample pictures and videos. While it can be reasonably expected it won't be worse in the typical scenarios than the modules in the Galaxy S III or the Droid DNA, it certainly sports a unique feature they don't, with its hardwired HDR video recording capabilities. All in all, with the Xperia Z announcement Sony seems to have climbed on top of the brand-name Android smartphone crowd, and, barring any significant hiccups in battery and camera tests, is likely to stay there at least for the first half of the year. Compromise, all 3 are great handsets. I think its an unfair comparison.galaxy S3 is 8 months old.better compare it with S4 & we will see who outdates whom. Wrong. SGSIII doesn't have a quad core processor either. That's a pretty important difference. SGSIII have Exynos series 4(4412) quad core processor. then it will be unfair for the Z and DNA, as they would be few months old by the time S4 launches.. smh.. I think Galaxy S3 fans have been dreaming of unicorns for too long. I'm pretty sure that next Galaxy S4 will have neither zero bezels, nor flexible screens or other exotic features. Very likely it will have a slight edge over the Xperia Z in processing power, a less advanced but still almost equally capable 13MP shooter and a few software enhancements. It will also most likely come with a common plastic body that they will forget again to design. I think that the Xperia Z will very likely remain the best combination of features and premium even after the GS4 will be presented. Well stated, but I don't think it's what the samsung fanboys want to hear. I will never again buy another android phone, but this is probably the only one I'd accept if somebody were to offer me one for free. I think it's safer to compare the phones that are already in existence. Same will happen when the SIV is released, it'll be compared to the Z/ZL which will have been 2/3 months old. all 3 is best now but must be wait for m7 & s4.. m7 is distinct phone of htc specially with sense 5.. i think dna > xperia z(alittle better than dna) > m7 > s4 maybe not.. This is a tough choice....I think I'd choose the Sony over the HTC because of the camera..... loll for me that is the only recall decisions.....the two phones are otherwise perfect. butterfly offers the same thing.. Except camera maybe.. but gosh, although I'm an HTC fan, but that Z is much better designed than the DNA.. I think this will be the phone that sways me away from HTC..
in what?? Processor again and Ram Interms of design, build quality, build endurance, xperia z is still has IT!!. Sammy has better battery life. but Sony is the best.well let's just wait till Galaxy S 4 comes out. alll these phone r great an people like to choices their phones an what there like about it in each phone. Should've waited for this before Note 2. BEST IN THE WORLD HANDSETS. I'm still buying the XPERIA Z.
honestly, we're all really spoiled by the quality of handsets now. Can't really go wrong with any of these, its all about preference really now. 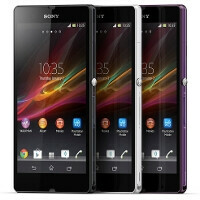 i wish sony will be the king of android... not samsung!! !